Virtual Keyboard or On-Screen keyboard is an alternative to an conventional keyboard. It is a software component that is used by computer users to enter text. Virtual keyboard can be operated using touchscreen devices, computer mouse or an actual keyboard. 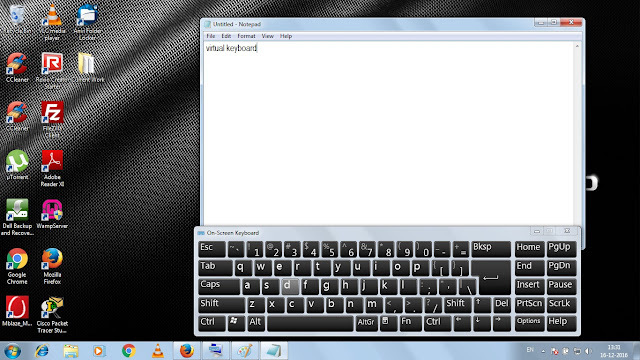 Operating systems like; Windows, Mac or Linux have a preinstalled virtual keyboard, that you can use for typing. Virtual keyboard is commonly used as an on screen keyboard to enter characters in devices which have no physical keyboard, such as personal digital assistant(PDA), tablets, palmtops, touchscreen devices or smartphones. But if we talk about security, then virtual keyboard play an huge role on it. Virtual keyboard can help you to minimize the risk of keystroke logging. What is Keystroke Logging ? Keystroke logging, or keylogging, or sometimes called as keyboard capturing, is the method of recording the keys strokes on a keyboard. Typically in that case the person using the keyboard is unaware about the capture of characters entered by him. There are mainly two types of keylogging techniques are used. Some of the software based keyloggers are; Hypervisor based, Form grabbing based (recording web form on submit events), Packet analyzers (To retrieve un-encrypted password) etc. Hardware based keyloggers work in a way, where the software running in the system for keylogging should be created for a specific hardware that is attached with the system. Keyloggers can be dangerous for your information security, as it can capture your passwords, which may result in stealing your personal data. That's why many important organizations (financial organizations, banks, government portals etc.) uses on screen virtual keyboard for their user login, especially for username and password entry. Remember : It is difficult for a malicious program to monitor the display and mouse to obtain what character is entered via virtual keyboard. If your Physical keyboard is not functioning then it is a good idea to use virtual keyboard. Virtual keyboard is useful to avoid infection spread in touch with physical keyboard. With the help of virtual keyboard we can reduce the chances of keylogging. An observer can watch the keystrokes more easily while the mouse is moving from one key to another. An visual observer can easily detect the keys pressed by watching the keys changing color when clicked. A user cannot type as fast as he could able to do with a physical keyboard.